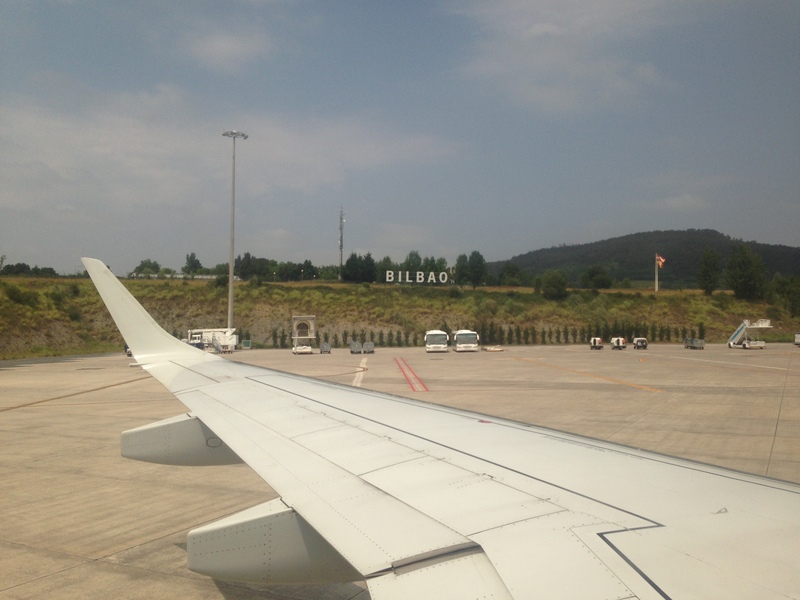 Our first stop: Bilbao. Why Bilbao? Well – they do have the largest airport closest to our other destinations (Rioja, San Seabastian), and they have the Guggenheim! So why not! 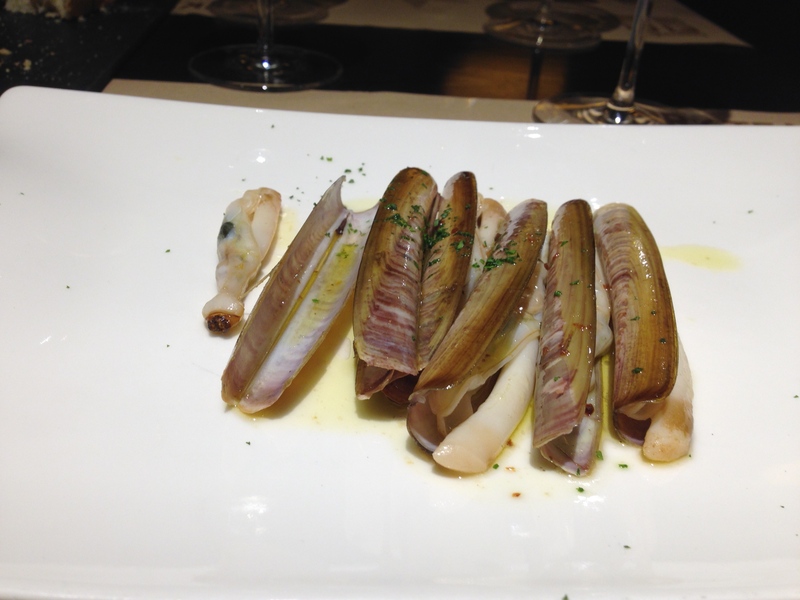 Oh – did I mention Bilbao also has delicious food? 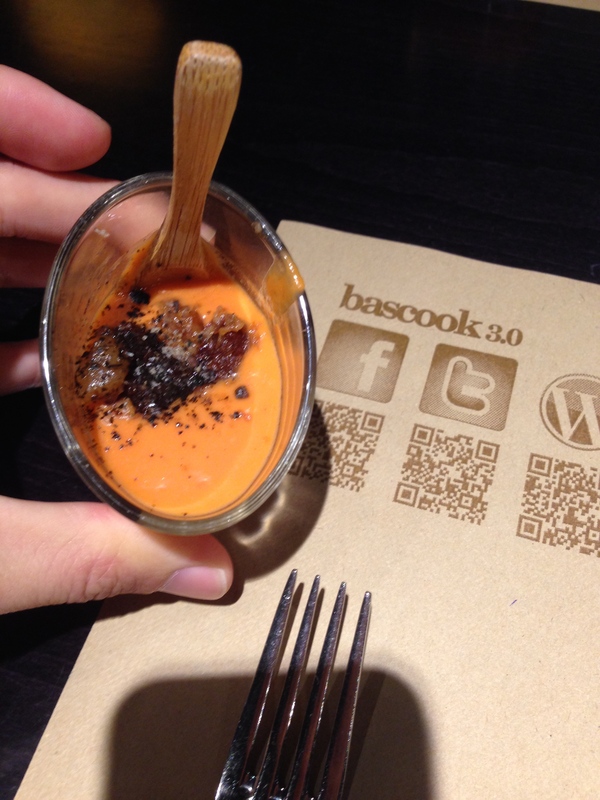 Our first night, we ate at Bascook, a restaurant that’s getting some attention for its blend of traditional basque cuisine with some “international flavors” and a smidge of fussy gastronomy. Whatever the concoction, let’s just say that this “tomato soup with pig” amuse bouche was amazing. Tomato, cucumber, and likely some red onion and fried pig … a stunning way to start the meal. People always say “wine’s so cheap in Europe”. That’s not true – it can be expensive, too! It just so happens that everyone drinks the cheap stuff. 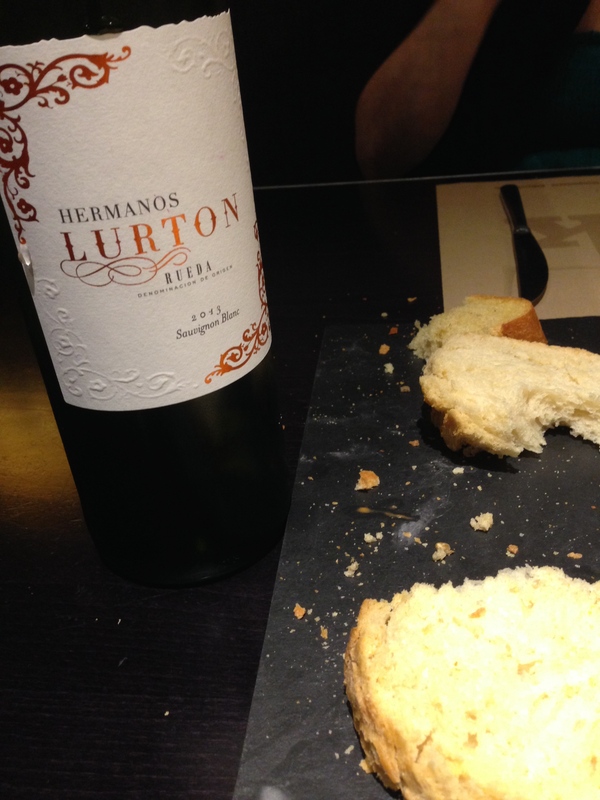 For example, take this 13 Euro bottle of Rueda Sauvignon Blanc. Cheap? Yes. Complex? No. 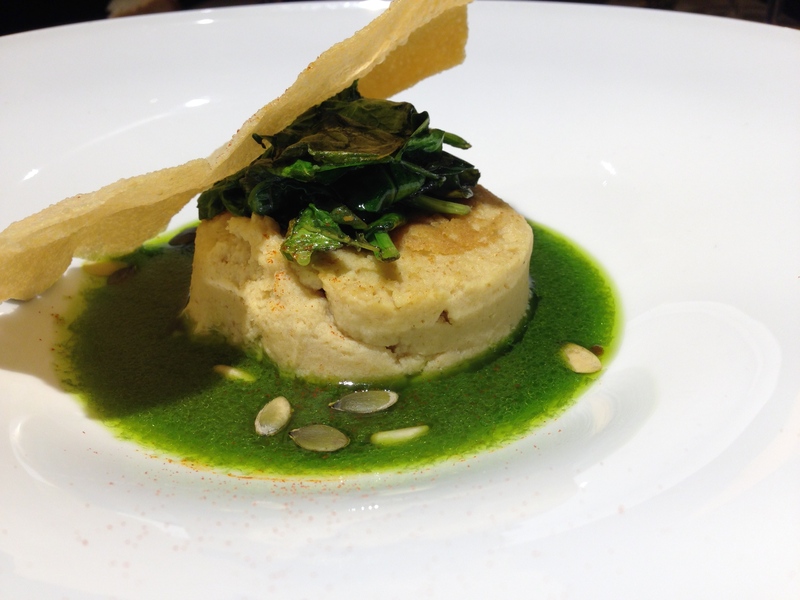 Tasty with food – ABSOLUTELY! We’d buy it buy the case, as it’s only 4 Euro a bottle if purchased at a store in Spain (that’s right! restaurants mark up wine in Europe, too!). Oh, and check out that bread – would you believe that it was REALLY spicy? No? Fine – don’t believe me – but when the waiter put it down, he said, in English, “and this bread is spicy – if you don’t like it, that’s ok, we will take it away”. Well, we liked it! We liked it a lot! Each time it was so surprising to bite into bread but then have this insidious onset of mouth heat. Good stuff, indeed! 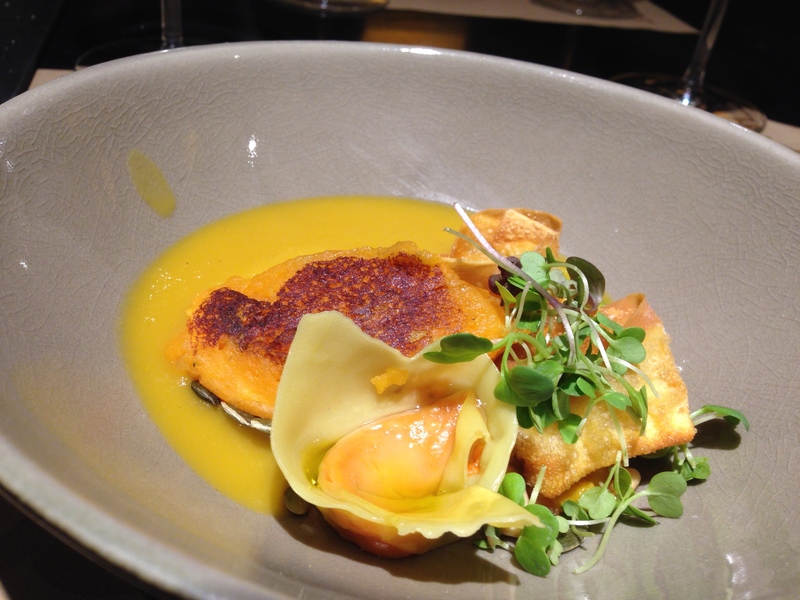 … and much fussier stuff, like this “pumpkin mix” dish. But just wait a sec – as fussy as it was, it was. There were steamed and fried gyoza that really gave you that classic Japanese/Asian gyoza flavor (but were filled with pumpkin!!) 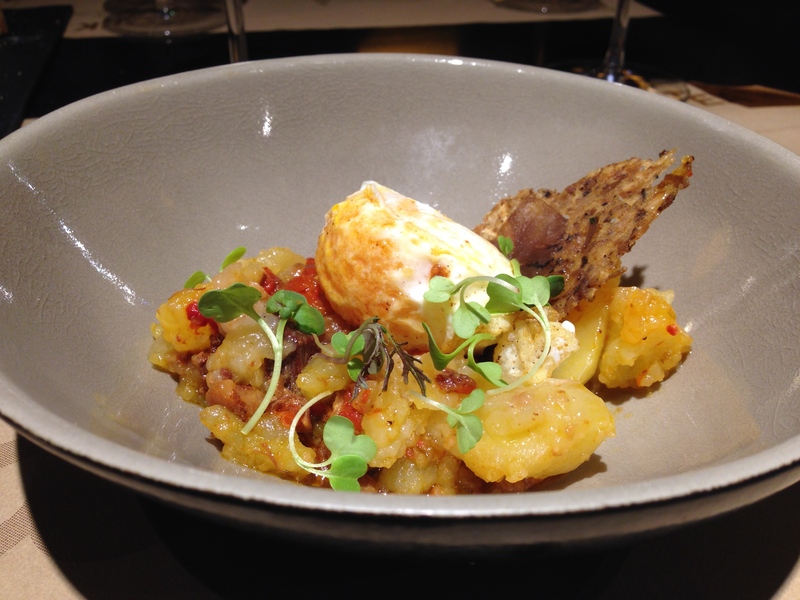 as well as a soup and puree that were wonderfully flavorful with just a little bit of spicy kick.